Pinedale native Kurt Feltner’s career may have passed through Arizona, Montana, New Hampshire, and Kansas, but his fondness remains for Wyoming and the institution to which he devoted most of his career – the Agricultural Experiment Station. The College of Agriculture and Natural Resources alumnus earlier provided for an annual young researcher award and has now established an endowment in honor of his late wife, Lynn, to create an award for the best student paper in Reflections, the research magazine of the college published annually by the Wyoming Agricultural Experiment Station (WAES). Kurt “Cub” Feltner worked with Pepper Jo Six in the UW Foundation to create the endowment. Lynn died 10 years ago from Alzheimer’s. Feltner met Lynn in Louisiana while he was in the U.S. Air Force during the Korean War. “Three months later, we were married,” he notes. They celebrated 58 years. Feltner presented the first award to Jessica Windh during the WAES research award reception in February. Windh, of Reedley, California, is an undergraduate student in rangeland ecology and watershed management. WAES director Bret Hess expressed his appreciation. “Cub is one of the most gracious and generous persons I have had the privilege to know,” says Hess. Feltner received his bachelor’s and master’s degrees at UW and earned his Ph.D. from the University of Arizona in 1963. He worked at UW after his Ph.D. then joined Kansas State University as an associate professor of agronomy. He then accepted the position of head of the plant and soil science division position at Montana State University. Nine years later, he became dean and experiment station director at the University of New Hampshire. 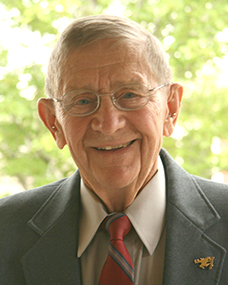 He returned to KSU in 1983 to become director of the KSU Agricultural Experiment Station and finished his career as executive director of the North Central Association of Agricultural Experiment Station Directors, retiring in 1994.